HomeTop Hat Gaming ManTop 50 Sega Saturn Games You Couldn't Play! - Japanese Saturn Exclusives! Why The Commodore CDTV Failed! – Full Console History! Why The Commodore Amiga CD32 Failed! – Full Console History! Did The ATARI XEGS Fail? – Atari XE Game System – Full Console History! The Failed Nintendo 64DD – Another Sega 32X !? Did The Sega Mega Jet Fail? – Rare Sega Hardware – Full Console History! Did The Sega WonderMega Fail? – Rare Sega Hardware – Full Console History! Top 50 Sega Saturn Games You Couldn’t Play! – Japanese Saturn Exclusives! Today Top Hat Gaming Man takes a look at the top 50 Sega Saturn games that remained exclusive to Japan! 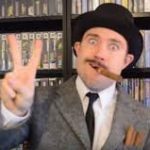 A man in a top hat, with a dashing moustache or a highly distinguished beard, reviews rare video games in his massive collection. Appreciate the finer things in life! Top Hat Gaming Man travels around the globe, playing the best games for the handhelds around the world. The best games are like fine wines and only get better with age. Today, Top Hat Gaming Man takes a look at the top 50 Sega Saturn games that remained exclusive to Japan!